This pass was on my list of passes to find, but it came looking for me. The reason that I tried to find it was, that it came highly recommended by my host, Mrs A.. As it turned out he was quite a cyclist at one time. He showed me his bicycle: Reynolds 531 said the little familiar label. The frame carried the name Bitetto - Italian, not Spanish he assured me. The rims were now bare, but at one time they carried sew up tires, the kind that were the hardest to repair, and you had to live in fear that they might roll off the rim during a particularly tight turn. Nobody rides on them any more. My French was just enough to decipher the reason for the beauty of this pass. On one side you have the mountains. On the other side there is the sea. Now the way that this pass came looking for me: I was on my first ride of this - let's call it a vacation , barely knowing where I was going, but generally taking the uphill when I came to a fork. I arrived at what I later learned was col de Saint Pancrace. A little ways down the descend on the north side a rockslide had closed the first short tunnel. So I backtraced my route and followed the signed detour. It climbed over a superb little hil, perfect for a touring mountain bike. This turned out to be the Col de Madone. I should also mention that this pass is very popular with professional racers living in the Nice area. Trek attached the Madone name to Lance Armstrong's bicycle during the time, that he was believed to have won the Tour de France seven times. From West. There are many possibilities for the lower approach. The profiled route is a less direct route, that contains several other passes as shoulder points. The highest one of these is the Col de Saint Pancrace. From here switchbacks without traffic lead to a great view across a gorge to Peille. During my ride I encountered more bicycles than cars. From East. (described downwards). The pavement is a little rougher on this side. Past a tunnel the little road emerges on a bluff across from Ste Agnes, advertised as the highest village in the Cote d'Azur region. An exploratory walk through Ste Agnes is also a major attraction of this excursion. 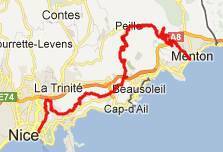 The profile route follows D22 all the way into Menton. Many other possibilities exist. You can also prolong riding without traffic, by going uphill instead. That option continues over Col de Banguettes. Col de Madone , Col de Banquettes: C177 bd observotoire > cd quatre Chemins(shp) >cd'Eze(shp) > col de la guerre(shp) > col de Saint Pacrace > Peillon > Col de Mandonne > Ste Agnes > Col de Banquettes > St Simeon > chemin de Traes > l'Escarene > col de Nice(shp) > Cantaron > Drap > Nice > sp: 48.5miles with 4540ft of climbing in 4:44hours (m4:12.5.10). Notes: This route goes up many cols as shoulder points, but it really crosses only two.